HUNTSVILLE, AL (WAFF) - Huntsville engineer turned financial guru, Michael Suttlar is shaking up the financial industry with his commodity trading investment firm SC Capital. Traditionally, commodities were labeled as volatile investments reserved for hedge funds and the top 1 percent. However, Suttlar and his team of engineers and mathematicians sought out to change that stereotype, making commodity investments both accessible and profitable for the average person. "We encourage everyone to invest from teachers to engineers," said Suttlar. Until about five years ago, the minimum investment required by most commodity trading companies was $100,000, creating a significant barrier to entry and boxing out 99 percent of people. SC Capital along with a bushel of firms across the country opened the market with substantially lower minimum investments. "We require a minimum investment of 10,000. That's 10 percent of your typical commodity investment requirement," said Suttlar. Suttlar's methodology is also unconventional, but for good reason. An engineer by trade, Suttlar began dipping his toe into the financial pool about eight years, and realized he couldn't necessarily do it better but a program could. Using his mathematics and engineering background, he began developing complex algorithms and artificial intelligence that could aggregate hundreds of thousands of data sources and reports daily, allowing him to make the most optimal trades and decisions. The intelligence pulls and sorts more data than a single person or small firm could possibly analyze. Suttlar and his team are constantly updating and revising the algorithms as new data sources emerge and the market moves. What if you don't understand algorithms and artificial intelligence? He and his firm are committed to transparency and consumer education. As a result, the firm is currently developing its own proprietary app that will allow their investors to see real-time trends and transactions within the marketplace. He will be one of less than ten commodity trading firms in the country to offer this technology. Today, the firm sends daily unbiased updates to their investors that showcase their individual investment standings as well as market data. "SC Capital values transparency. We feel as though it's important to share all data and trades, even in the event of a day with a loss," said Suttlar. The question for many still remains: Why invest in commodities? Diversification is the simple answer. A healthy balance of stocks, bonds, real estate, alongside commodities offers great potential and opportunity when it comes to building wealth. 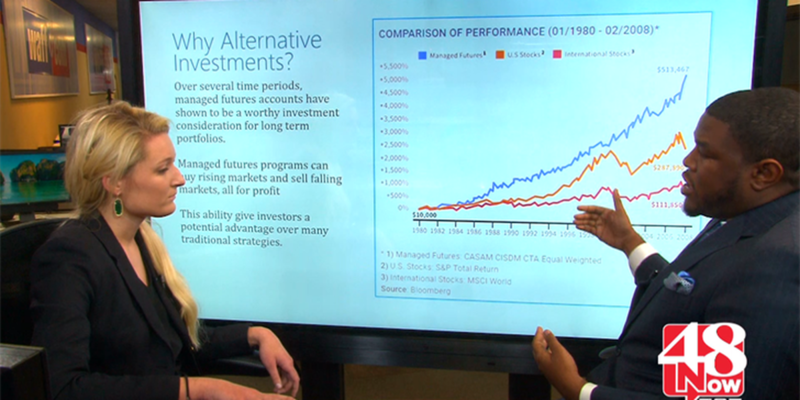 "Brokers, financial advisers, traders, and investors don't agree on many stances, but one thing we do agree on is the importance of a diverse portfolio. That's one thing that has never changed," said Suttlar. However, one thing that sets Suttlar and SC Capital apart from most investment firms is the absence of management fees. "We believe in "eat what you kill" with respect to fees, and this is largely different than traditional managed investments like mutual funds. We only charge a fee on profits we make for our clients. If we don't make money, we don't charge a thing. It keeps us honest," said Suttlar. How can you start investing? "Everything from our initial consultation to account setup can be accomplished online. We have clients from all over the US. However, for local clients, we prefer setting up an appointment at our office in downtown Huntsville. We like ensuring that our clients are a good fit for the investment process and our company culture," said Suttlar. What's next on the horizon for the commodity company? Suttlar is taking a three pronged approach that includes educational outreach, new data, and aggressive recruitment of new employees. The company is currently comprised of six employees.